Most new technology, whether focussed on a device or a formulation includes at its heart a phase boundary or interface. So for example, a polymeric solar cell or indeed a biosensor has a layered architecture that requires different materials to adhere to each other for optimum functionality. Alternatively, a drug will usually be delivered in some sort of capsule that both contains it and enables it to be selectively delivered to a target organ. In this program we are concentrating on the fundamental surface chemistry that will optimise chemical and physical function at the junction of two materials. Our focus is on surfactant and polymer molecular-scale activity at solid-liquid and solid-gas interfaces. The use of electrically conducting plastics has revolutionised the electronics industry, but the devices prepared from these materials are often limited by the inability to control the structure of the materials at the smallest dimensions. In this project we are preparing conducting polymer nanoparticles for use in electronic devices in which the size, position and composition of the particles are highly controlled. This will allow the composition, structure and therefore efficiency of devices such as new solar cells, to be optimised. It is hoped that via this approach that we can overcome current limitations in device efficiency which are attributed to phase separation of blends of conducting polymers. With our novel combined focus on the polymer chemistry, the surface chemistry and the device electrochemistry, progress in this field should be readily achieved. We have recently reported the first definitive evidence of the retention of micellar structures within self-organised multilayer films of low glass transition temperature diblock copolymer micelles . Previously the retention of micellar characteristics within electrostatically assembled micellar multilayer coatings had only been postulated. The significance of this result is that micelles partition solutions into more and less hydrophobic regions as utilised in many simple surfactant applications from cleaning to cosmetics. Retention of this microphase separation within a multilayer architecture opens the door to potential slow release or sequestration applications of active molecules of a wide variety of polarities from topical skin products to drug delivery. That is, we are now better positioned than ever to control the capture and/or release of a target molecule in a smarter way. E .G. Smith, G.B. Webber, K. Sakai, S. Biggs, S.P. Armes, E.J. Wanless, Direct visualisation of a self-organised multilayer film of low Tg diblock copolymer micelles. J. Phys. Chem. B, 111, 5536 (2007). Building on our extensive expertise in the characterisation ofw the adsorption of block copolymer micelles  we have successfully demonstrated the sequestration, release and recapture of pyrene into the hydrophobic cores of diblock copolymer micelles adsorbed to silica particles. This is the first time that low glass transition temperature copolymers have been reported to exhibit this behaviour. 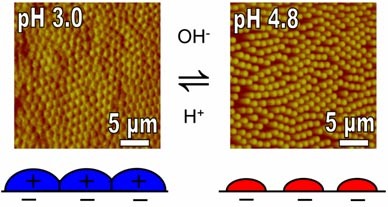 The key novelty of this capture and release example is that the micelle cores are not extremely hydrophobic, demonstrating that a target molecule of intermediate polarity could be delivered in this way. K. Sakai, E.G. Smith, G.B. Webber, C. Schatz, E.J. Wanless, V. B??t? ?n, S.P. Armes, S. Biggs, Comparison of the adsorption of cationic diblock copolymer micelles from aqueous solution onto mica and silica. Langmuir 22, 5328 (2006). K. Sakai, G.B. Webber, E.G. Smith, C. Schatz, E.J. Wanless, V. B??t? ?n, S.P. Armes, S. Biggs, pH-responsive diblock copolymer micelles at the silica/aqueous solution interface: adsorption kinetics and equilibrium studies. J. Phys. Chem B.110, 14744 (2006). K. Sakai, E.G. Smith, G.B. Webber, M. Baker, E.J. Wanless, V. B??t? ?n, S.P. 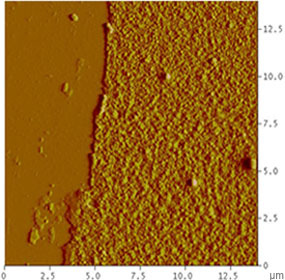 Armes, S. Biggs, Characterising the pH-responsive behaviour of thin films of diblock copolymer micelles at the silica/aqueous solution interface. Langmuir, 22, 8435 (2006). We have also been investigating the adsorption of microgel particles. Microgels are lightly cross-linked polymer particles that typically contain stimulus-responsive groups derived from pH, temperature or solvent sensitive monomers. These stimulus-sensitive groups allow the particles to be exchanged between either a non-solvated latex state and a solvent-swollen gel state. Advantages offered by adsorbed microgel films over alternative polymeric coatings include: the anticipated reversibility of the response, the large volume change (up to two orders of magnitude), the relative ease of manufacture of stimulus-responsive microgel particles by emulsion or dispersion polymerisation, and facile film preparation by spontaneous deposition from aqueous solution. Microgel layers can also have advantages over layer-by-layer polyelectrolyte films for applications that require control over the lateral morphology or layer thickness. Smart surfaces such as adsorbed microgel coatings that exhibit reversible pH-modulated contact angle variation and variable topography may be useful for soil release applications and possibly also the delivery of hydrophobic actives such as drugs, pesticides or fragrances. Therefore an investigation of the morphological changes exhibited by microgel coated surfaces is timely and of importance to their ultimate utility. The formation and morphological changes of a pH-responsive microgel layer on silica and mica have been studied by in situ Tapping Mode Atomic Force Microscopy . First, lightly cross-linked, sterically-stabilised poly(2-vinylpyridine) (P2VP) particles were adsorbed in their non-solvated latex form at pH 4.8 to produce a structurally-disordered monolayer that covers the entire substrate. 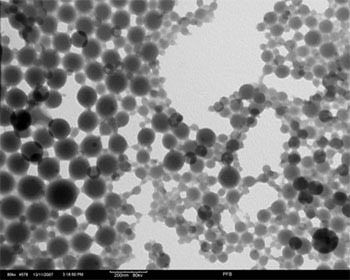 Addition of acid to this particulate film induces a latex-to-microgel transition at pH 3.0, causes particle swelling (and also some desorption) and produces a uniform, swollen film with localised hexagonal packing. Returning to pH 4.8 causes partial microgel deswelling to form individual oblate spheroidal P2VP latex particles, which retain the localised order previously induced by swelling. The swelling and collapse of this P2VP film was reversible during subsequent pH cycles, with no further desorption observed. The adsorbed amount of P2VP microgel/latex was quantified at each pH by determining the surface density and dimensions of the adsorbed particles. These measurements have enabled a microgel surface excess to be reported for the first time. P. FitzGerald, D. Dupin, S.P. Armes, E.J. Wanless, In situ observations of adsorbed microgel particles. Soft Matter 3, 580 (2007).